Thanks to the “genius” of the electoral college, if you live in a sure-fire red or blue state you might feel like your vote doesn’t matter much. You can still have an impact, though, by reminding friends in swing states to vote. But which of your friends live in swing states? 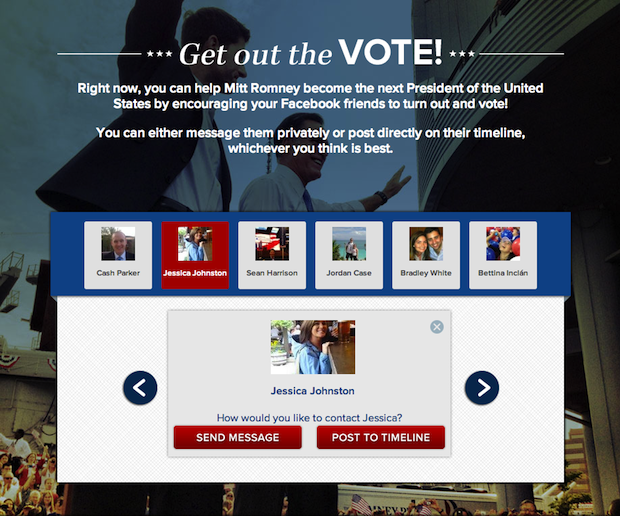 Obama’s “Remind Friends To Vote” app and Romney’s “Commit To Mitt” show you who to make sure made it to the polls. Both apps pull in your Facebook data, show you a list of friends in swing states, and let you instantly share with them a statement or image encouraging them to cast their ballot. Obama’s lets you deliver a wall post, while Romney lets you do the same or be more discreet with a private message reminder. You could also use the apps to figure out who to send text messages and make phone calls to. Note that Obama’s app seems to running a little slow with all the traffic so be patient and give it a minute or two to load. And if you still haven’t hit up the polling center yourself and carry an iOS 6 device, political startup Votizen lets you save to your Passbook a card showing who you want to plan to vote for. That way you can research candidates and issues at home without worrying you’ll forget when you get in the booth. Afterwards, you can follow along with what people are tweeting about the election with Votizen’s live social media monitoring dashboard. So go, make your voice heard even if not through your vote. Here’s links to Obama’s “Remind Friends To Vote” app and Romney’s “Commit To Mitt” app. Election Day Prep: Is Your Congressman Tech-Friendly?